Hester: My name’s been pulled out of the hat. I’m part of a group of people celebrating the ten-year anniversary of 26’s existence and the twenty-five years of Letter Exchange. Hester: Receive the brief. Each team will produce a work of art – the majority on paper but a few may be three-dimensional. I’ve always written long pieces for print or websites. Some poor sucker, I’m thinking, will get the three-dimensional bit. Discover I’m teamed up with Teucer Wilson. I’m wondering if people were paired together based on their unusual Christian names but it’s actually done in alphabetical order of the surnames. We’re last in the list and have the letter Z. Look Teucer up on the internet and discover his preferred medium is stone. So I’m the sucker. Send him an email to say hello. Teucer: I’m experiencing a mixture of feelings about this project: trepidation, excitement and reticence. I anticipate many hours being spent on creating a work with no guarantee of any financial reward. Plus I’m really busy with commissions and I need to pay the mortgage. On the other hand, it’s an opportunity to work in a different way and be part of something bigger. Hester: Meet up with fellow 26ers and Letter Exchangers to choose the word that goes with our letter. Unfortunately, Teucer can’t be here. Among the ‘Z’s’ of a large dictionary, I randomly select ‘zaffre’. It’s evocative and attractive but I’ve never heard of it. No one else has either. Chambers 20th Century Dictionary explains: the impure oxide (used as a pigment) obtained by partially roasting cobalt ore previously mixed with two or three times its weight of fine sand (From zafre of Arabic origin.) It can also refer to a particular, sapphire-like blue. Hester: Teucer and I talk on the phone. He suggests I write something short like a Haiku. Good idea but I’ve never written one before. Maybe he could write it and I’ll have a go at stone cutting. Hester: Start on the research. Zaffre is used for colouring ceramics and glass. Some of the first blue (and white) ceramics to reach Western Europe were from China’s Tang Dynasty (618-907 AD). It was a colour combination with instant appeal. Gradually, potters in Arabia produced their own blue and white ware. From about the ninth century, this was used as ballast in ships trading spices and silks from Eastern Mediterranean countries to Italy. But the ballast became popular too. Italians started developing their own blue and white ware. Zaffera a rilievo, an Italian term, describes a blue cobalt ore applied thickly in relief as a decorative effect on ceramics. During the Renaissance, the Hospital of Santa Maria Nuova in Florence commissioned 1,000 blue and white drug jars whose shape was derived from Arabic jars. Gradually, over hundreds of years, the popularity of blue and white ceramics spread across the Western world. Indeed, my own kitchen features blue and white spice jars. Hester: Meet Teucer at his studio in the depths of the Norfolk countryside. His assistant is working on the reverse side of a memorial, designed by Teucer. Roses and irises climb up and around the stone. Almost worth dying for. Teucer: Meet Hester and realise we can work together and make something of this unusual situation. We brainstorm ideas based on the research and already I’m thinking about working in relief, possibly in marble. I like the idea of creating a bowl in bas-relief within the lettering. I tell Hester I need her to write less than 100 characters. Shorter than a tweet. Hester: Inspired, I start writing as soon as I’m back on the train. I ditch the Haiku idea after Norwich: they need years of practice. Other ideas pour out of me. Hester: Regularly send Teucer my ideas. Teucer: Regularly remind Hester I want less than 100 characters. Hester: Never has so much time been spent writing so little. Hester and Teucer: We agree on our favourite ‘poem’ that will work in terms of length and imagery. It describes the chemical and Arabian roots of zaffre, how over many years the colour travelled to and through Western Europe appearing on ceramics and glass that most of us have used: a colour fit for a banquet. It works with Teucer’s initial idea of a sculptural bowl having letters carved around the broad rim. Creating this from a single block of marble will be a challenge but that’s what this project is about. Teucer: Send Hester a few designs. We agree on the best and discuss a few minor changes. I’m leaning towards my own design of an italic cursive typeface for the piece: ‘Sarah Street’ named after my wife and an Otis Spann song. Its forward flowing movement and rhythm is less monumental, more human and helps tell a story. Also it echoes the theme of travel and works well in a circle. 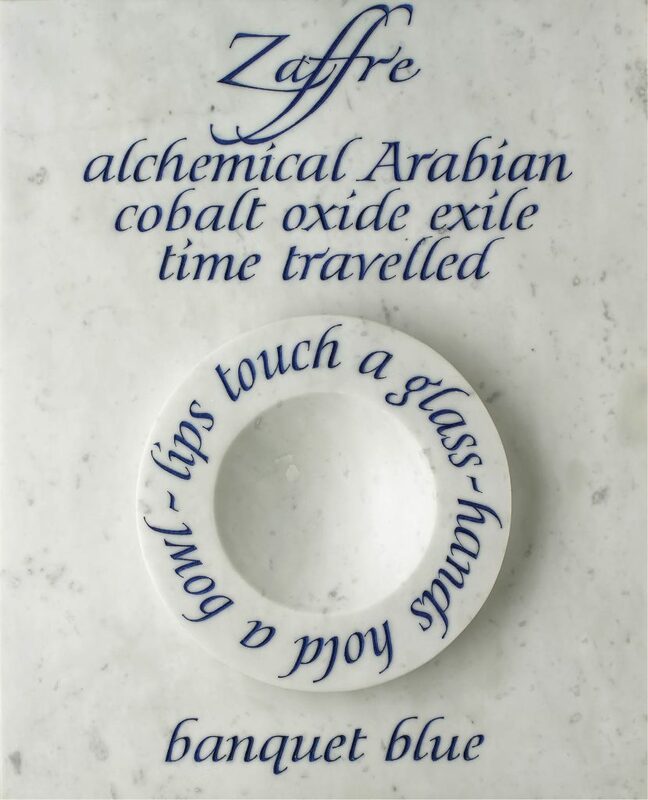 I also choose marble as it has a precious vibrancy, resonating with the idea of alchemy. I buy the marble; it’s a hard material to work. The bowl emerges. I’m cutting the letters around 20mm high, wearing a special magnifying lens to help me see these small letters clearly. There’s interruptions for holidays and work for paying clients. I work out how to create a digital version of zaffre blue, get it professionally printed and scanned, then have the paint made. Teucer: Paint is teased out over the edges of the lettering. It always looks a mess until the surface is sanded back and the excess paint removed. The zaffre blue stands out beautifully against the marble. This piece has taken around 20 days to create from initial design to finished piece. Send Hester a photograph. She’s pleased. So am I. Now we sit back and wonder what other people will make of it.